Tronsmart Vega S89 (Elite) is an Android TV based on Amlogic S802 quad core ARM Cortex A9 processor @ 2GHz, and is one of the fastest Chinese ARM box on the device, at least until Rockchip RK3288 and AllWinner A80 devices come to market. In my unboxing post, I mentioned the UART pins were available, and sometimes in March Amlogic released U-boot and Linux source code for M802/S808, so it’s likely some developers will play around, and eventually run Linux (Ubuntu, Debian, …) on the platform. So today, I’ve done some preliminary work by connecting a USB to serial debug board to my device. The steps to follow are straightforward, and should work on Beelink M8/S82, Jesurun S82, MBOX-S82, IdeaStar S82, etc… which are basically the same box with different names. Before accessing the serial port, we’ll need to open the box. 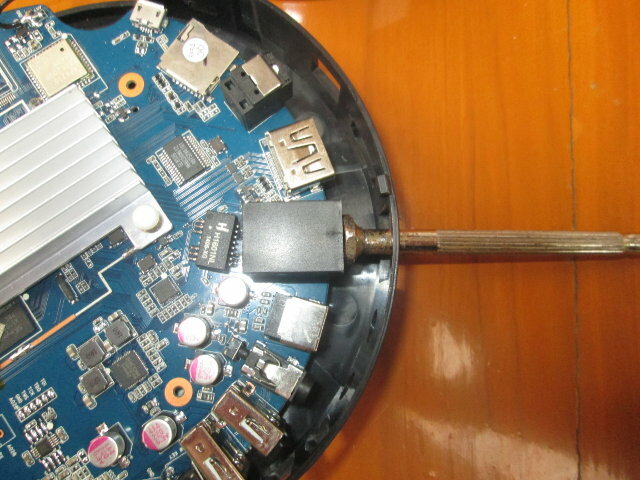 Start by removing the 3 sticky pads at the bottom of the device with a flat-head screwdriver, and remove the 3 screws. 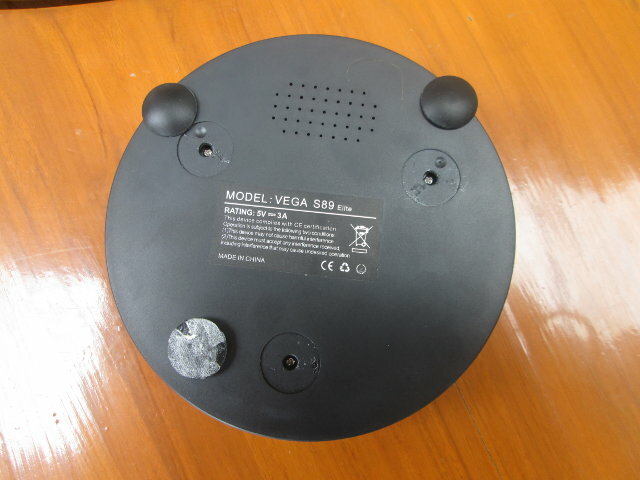 The top of the enclosure can then easily be removed, but be gentle in order to avoid damaging the Wi-Fi antenna. To remove the board from the bottom plate of the enclosure, you’ll need to push the board laterally. I’ve used the back of my screwdriver to push against the RJ45 connector. 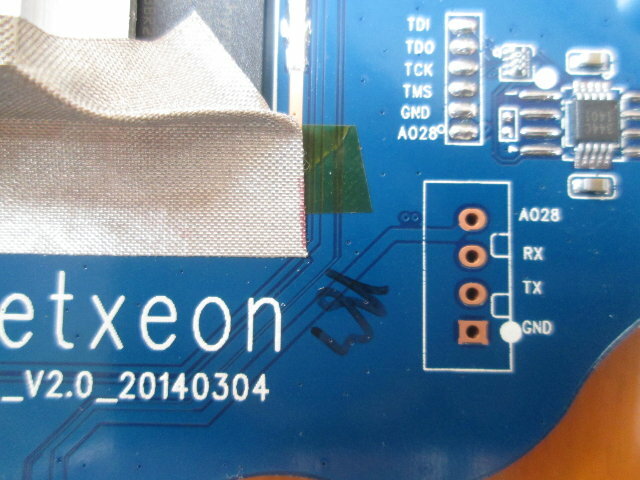 Then locate GND, Rx and Tx UART pin on the 4-pin header close to Netxeon markings to solder a 4-pin 2.5mm header. Finally simply connect a 3.3/5V USB to serial debug board as shown in the picture below. 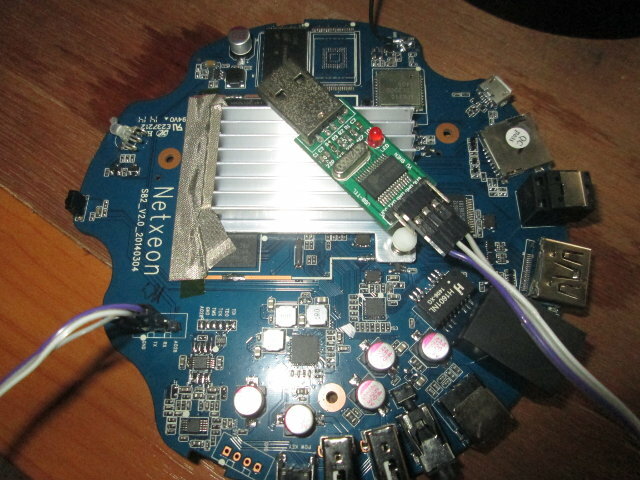 You only need to connect GND, Tx and Rx to GND, Rx and Tx between S802 board and the debug board. That’s all! If you want to put the board back in the case, you’ll need an isolation pad between the 4-pin header on the board, and the lower heatsink, which is conductive, in order to avoid short-circuits. 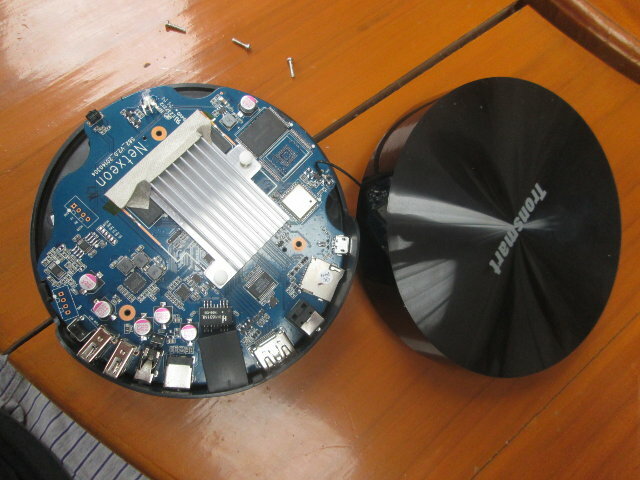 I’ve also found out that it can be a real pain to reassemble the board and the enclosure because of the round shape makes it difficult to properly align connectors. Start load M8 SMP code! Load M8 SMP code finished! [ 0.671548@0] SMP: Total of 4 processors activated (8.00 BogoMIPS). [ 0.677774@0] CPU: All CPU(s) started in SVC mode. [ 0.785040@0] Init pinux probe! [ 0.846154@0] aml-i2c i2c-AO: aml i2c bus driver. [ 0.876492@0] aml-i2c i2c-A: aml i2c bus driver. [ 0.903373@0] aml-i2c i2c-B: aml i2c bus driver. [ 0.933624@0] aml-i2c i2c-C: aml i2c bus driver. [ 0.960496@0] aml-i2c i2c-D: aml i2c bus driver. [ 1.090484@0] hdmitx: hpd: HPD deasserts! [ 1.149411@0] TV mode 576cvbs selected. [ 2.251888@0] Advanced Linux Sound Architecture Driver Initialized. [ 2.892761@0] Video Technology Magazine Ion Video Capture Board ver 1.0 succ. [ 4.304042@0] Nand PHY driver Version: 1.01.001.0004 (c) 2013 Amlogic Inc.
[ 4.700712@0] Please config savepowermode. [ 4.704724@0] Please config reset_pin_enable. [ 4.709086@0] Please config reset_delay. [ 4.712966@0] Please config reset_pin. [ 4.815901@0] SARADC Driver init. [ 5.056288@0] ADC Keypad Driver init. [ 5.085001@0] !! !ntp_ts: ret = 0. [ 5.088321@0] VTL ct36x TouchScreen driver, &lt;george.chen@vtl.com.cn&gt;. [ 5.106959@0] VTL ct36x TouchScreen driver End. [ 5.207852@0] GPIO Keypad Driver init. [ 5.249583@0] 0x000000000000-0x000000060000 : "bootloader"
[ 5.255797@0] 0x000000100000-0x000000110000 : "ubootenv"
[ 5.481505@0] [aml_sdio_probe]: there is not eMMC/tsd, skip sdio_c dts confi! [ 5.579115@0] [aml_sdio_probe] aml_sdio_probe() success! [ 5.765334@0] amvdec_656in module: init. [ 5.774038@0] amvdec_656in probe ok.
[ 5.777557@0] amvdec_csi probe ok.
[ 5.786290@0] [viuin..]viuin_probe probe ok.
[ 5.790654@0] [isp..]isp_probe isp probe ok.
[ 6.144632@1] Netfilter messages via NETLINK v0.30. [ 6.156254@1] ctnetlink v0.93: registering with nfnetlink. [ 6.168293@1] NF_TPROXY: Copyright (c) 2006-2007 BalaBit IT Ltd.
[ 6.289315@1] meson_pm_probe done ! [ 6.417803@1] aml_thermal bind thermal-cpufreq-0 okay ! [ 6.522938@0] SELinux: Permission attach_queue in class tun_socket not defi. [ 8.371954@3] init (1): /proc/1/oom_adj is deprecated, please use /proc/1/oo. [ 8.385336@3] aml_nftl_dev: module license 'Proprietary' taints kernel. [ 8.402738@3] ntd device 250! [ 8.520518@3] ntd device 250! [ 8.761315@3] ntd device 250! [ 11.417991@0] init: data_integrity_guard main!